When it comes to choosing the right fence for your Maryland home, you have a lot of options. There is wood – an oldie but a goodie. While it requires annual maintenance, many people love the natural beauty wood has to offer. Then there is ornamental aluminum or steel fencing. These imposing fences add instant curb appeal to whatever landscape they adorn. Next comes chain link, the perfect fence for the cost-conscious homeowner. And then there is vinyl. 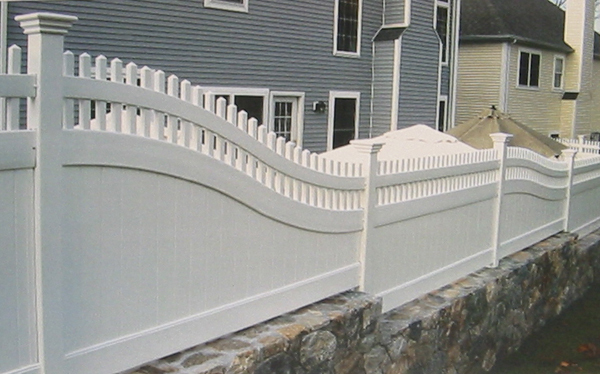 A Vinyl Fence is beneficial for so many reasons. First and foremost, these fences look good. Period. And because they are so durable, they will look good for years to come with very little maintenance. While wood requires annual painting or staining, vinyl fences only require occasional cleaning. For that, all you will need is your hose. These fences are also affordable; they will help increase home value; and so much more! With so many benefits, it is no wonder why countless Maryland homeowners choose vinyl fencing. And because we are one of the only manufacturer/installer of vinyl fencing in Maryland, it is no wonder why so many of those homeowners turn to Mid-Atlantic Deck and Fence Co.
All Vinyl Fences are not created equal. Trust Mid-Atlantic Deck and Fence! Mid Atlantic Deck and Fence has been manufacturing and installing vinyl fences for our customers since 1996. We invite you to visit our facility located at 800 Rt. 3 South in Gambrills, Maryland to see exactly how your new vinyl fence will be built. Our computerized CNC routing machines enables us to offer thousands different styles and colors. Each and every vinyl fence is backed by a lifetime transferable manufacturer warrantee. If you are a Do-it-Yourselfer we can provide you with the experience and the knowledge to make your project a breeze. Mid Atlantic’s commitment to the quality of our vinyl fencing and to our customers assures you that you get the best quality vinyl fence on the market. If you have any questions about a Vinyl Fence for your Maryland home, please contact Mid Atlantic Deck & Fence (MAD Fence) today by clicking here or calling 1-800-833-9310. You can also follow us on Facebook and Twitter as well.